We are rating this show on an ongoing basis because it is getting worse. The most recent episode, Sanctuary Part 1, was particularly sappy. The Helm wanted me to turn it off three quarters of the way through after 13-year-old Jimmy hugged Captain Weaver. That's wussy stuff. That doesn't belong in a post-apocalyptic sci-fi show. No one wants to see that. Mathew: But it's got a lot of sappy stuff, and characters who act totally stupid in order to move the plot along, and this one creepy religious chick and it's kind of got a lot in common with this book series called The Tripod Trilogy, and it's also clearly trying to cash in on the success of The Walking Dead, which is a way better show. Helm: So, we should cease wasting our precious time on it and devote that hour ever Sunday night to improving your skill with the sword. Mathew: Now hold on there, Helm! Let's not be hasty! It does have some things going for it. Mathew: Well, the design of the aliens is really pretty cool. I mean, they call them "skitters" and they look sort of like cool bug/lizards. Also, the effects are really pretty good and most of the acting is pretty solid and, when there's action, things move along pretty well. Helm: So, we should keep watching it. Mathew: Well...not so fast. This show makes me mad sometimes because everybody is totally stupid. In Game of Thrones, which is a great show, or The Walking Dead, which is a great show, the characters are really smart. In fact, in Game of Thrones, they're actually too smart for their own good--which continuously moves the plot along. 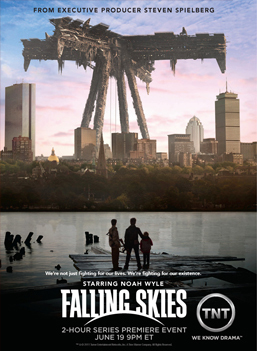 In Falling Skies, people routinely act like irrational idiots. I mean, I know they're overwrought because civilization was pretty much wiped out by evil aliens and everything, but they just keep doing really really dumb stuff in order to keep the plot moving. And even the aliens act really stupid. I mean, don't they know anything about taking over a planet? Sheesh! Helm: So we should stop watching! Enough with the potato chips crumbs on your futon! Enough with the soda guzzling! One hour of TV Sunday nights (True Blood) is more than enough! Mathew: Why does it always have to be all or nothing with you? Can't we just... I don't know... give it another episode and see what happens? Helm: You've been saying that since the 2 hour premier. And the maudlin qualities of the show are maddening! If I have to see one more sequence of children playing amidst the ruins of the planet, set to sappy music and leading to shots of the adults looking sad and reflective, I will vomit. Helm: Which makes it that much worse. Come now, does this show not feel like the ABC afterschool special version of The Walking Dead? Mathew: Yes, sometimes. And nice reference there, Helm. I can see that the grueling hours of TV watching I'm putting you through are starting to pay off! But look, I say the jury is still out on this one. Every time I think I'm done with it, it does something cool. Every time I think it's turned a corner and is getting cool, it does something stupid. I... I need more time. Helm: If only Game of Thrones or The Walking Dead were not between seasons. Two & a half Flaming Swords!! Three & a half Flaming Swords!! Helm: I believe that further training in combat would be a much better use of your time. One additional hour of heart pounding exercise would do you a great deal of good. Mathew: Yeah. We're giving the show another week.